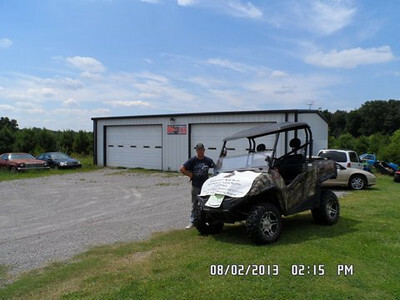 pm me if you wish to purchase one of these utv's (side by side) off road vehicles from Texas. I have a 72 volt electric demo unit w/ camo available. Hunting season is coming. For every TITAN UTV bought by a Huntsville Car Scene member thru me Huntsville Car Scene gets $200.00! These are some great looking utv's, and I like the fact they're made in the USA. I would like to have the Scout H4, but I don't see who can justify dropping 18k on a vehicle that is offroad only. If I could drive it to work every day, pick up the kids, get groceries etc. that would be a different story. That applies to all the 4 seater utv's on the market, they are priced outside 90% of potential buyers budgets for an offroad toy. But, good luck with sales. Last edited by Kornbred; September 5th at 08:36 AM. My wife's family has a UTV they use on there farm and it blew my mind when I found out what they cost. For the right person (someone with a farm) they are worth the money but like you said it seems to be a pretty small market. I think they are cool as can be but I could never afford to spend that kind of money on a off road only toy. Last edited by EvilZ; September 5th at 08:56 AM. A low speed vehicle is defined as a four-wheeled motor vehicle with a top speed of not greater than 25 miles per hour, a gross vehicle weight rating (GVWR) of which is less than 3,000 pounds and complying with the safety standards provided in 49 C.F.R. Section 571.500. The term includes neighborhood electric vehicles. Low speed vehicles may only be operated on the public roads if they are certified as meeting all federal and state statutes, rules, and regulations governing safety, emissions, and antitheft standards. Accordingly, the license plate issuing official must verify the following information before registering a low speed vehicle. The low speed vehicle must have a 17 digit vehicle identification number (VIN) which conforms to National Highway Safety and Traffic Administration (NHTSA) standards, and the manufacturer’s statement of origin (MSO) must state that the vehicle complies with the safety standards for a low speed vehicle or that the vehicle complies with Title 49 Code of Federal Regulations (CFR) section 571.500. The manufacturer will also affix a decal certifying that the vehicle meets these standards. Often the MSO or bill of sale will reflect that the low speed vehicle is for off road use only, which indicates that the low speed vehicle cannot be licensed for use on the roadways. If the MSO or bill of sale states “off road use only”, the vehicle cannot be registered. Effective January 1, 2012, no certificate of title shall be issued for a low speed vehicle. Prior to issuing a license plate or transferring a license plate for use on a motor vehicle that is not required to be titled, the license plate issuing official must physically inspect the vehicle to verify that the VIN on the vehicle is the same as the VIN on the documents required to register the vehicle [§32-8-32(b)]. This inspection will also enable license plate issuing officials to determine whether the vehicle can be registered in Alabama. Operation of vehicles that are not intended for use on the roadways, regardless of whether they are registered, may subject the vehicle operator to citation by law enforcement. Brian, we will register a low speed vehicle with the MSO, bill of sale, and the physical inspection of the VIN. Thanks for your inquiry and hope you have a great weekend. demo (72 volt e2) unit shown above for sale, camo, windshield, speakers, 4 way seat belts, lights. ran it at stoney lonesome offroad park in cullman, ran all day on one charge. climbed steep & ruts areas very well, great for hunting. $14k or offer. still available, great hunting vehicle-many mods installed. Did the company go out of business..? Website doesn't work and neither does registered phone number.